Cold and wet this morning; big storm out west headed this way, we're told. I've got coffee and pastries and a million things to do -- all indoors -- so I'm not too worried about the weather. The birds are, as always, busy, busy, busy. 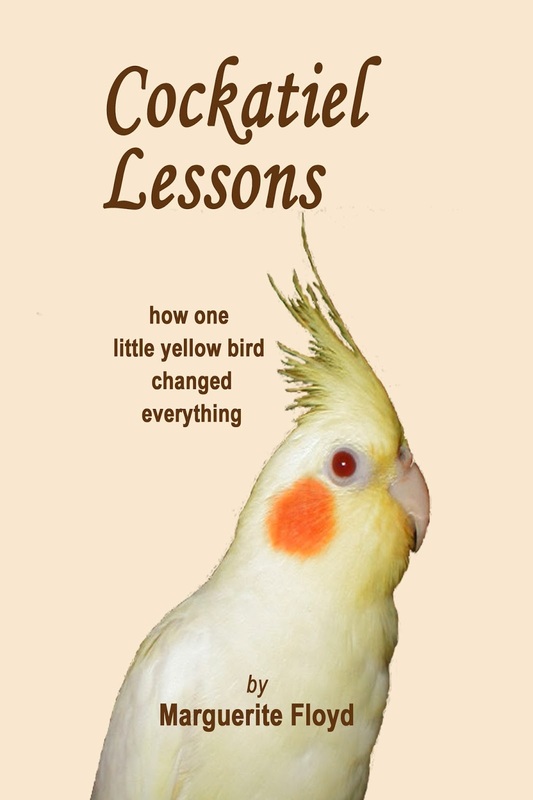 Charli is chewing up a nice thick paperback book that cost me $1.00, and the two cockatiels have come out of the cage in order to climb up to the top and then down to the bottom and then back up to the top and down to the bottom. If something startles them, they'll fly into the kitchen and land on top of the cabinets. Here is a picture of them just as I opened the cage door this morning. And here Flash demonstrates how to leave the cage and climb around to the back of the cage where he likes to hide behind the cage cover so that I can't see him and immediately freak out, thinking he's gotten out and is in trouble somewhere . . . . with Cheb supervising and encouraging him on. It was a very good day for Cheb, though he doesn't know it. It was a good day because I emptied out the box of mixed seed he's probably been eating all his life. Of course, we don't know how old he is or what his life was like before his other mom found him, but I'm going to assume he's always eaten mixed seed. 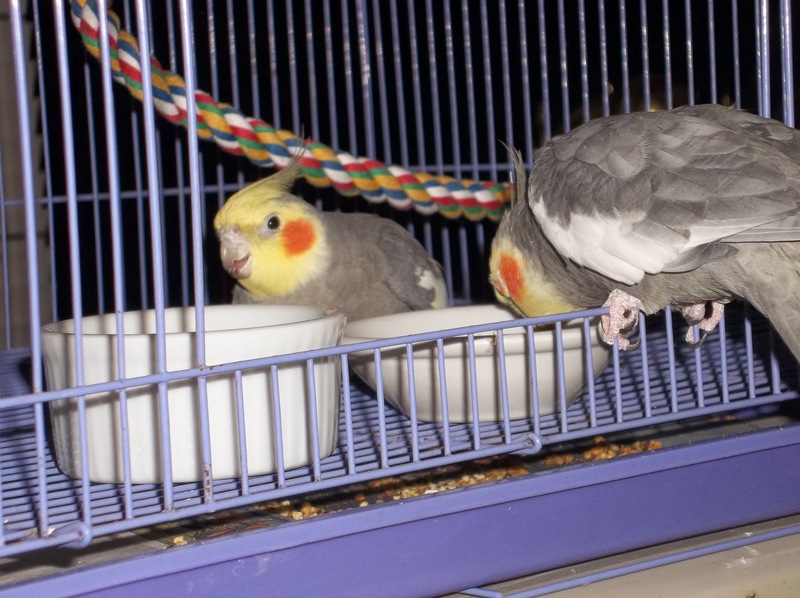 The number one cause of death of pet parrots is STILL malnutrition from seed-only diets. Still! Why? I think because people don't really know enough about parrots when they bring them into their homes. 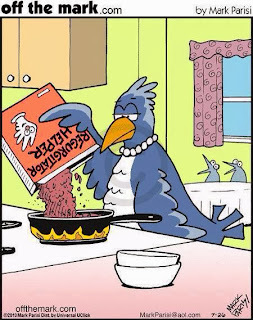 Parrots need good quality pellets and vegetables, fruits, a nut or two once in awhile. Sure, parrots like seeds -- humans like chocolate, too -- but it shouldn't be the only item on the menu. Cheb made it very clear from the start that he was not interested in pellets. Most likely, he didn't even recognize them as food, though I did eat a few in front of him to demonstrate. So I began crumbling Nutriberries over his seed mix, and was thrilled to see that he actually ate a bite or two of that. 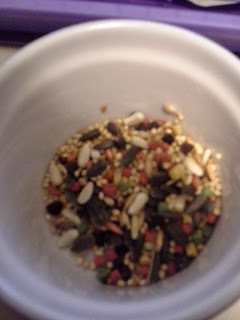 I reduced the amount of seed and keep supplying the crumbled Nutriberries. 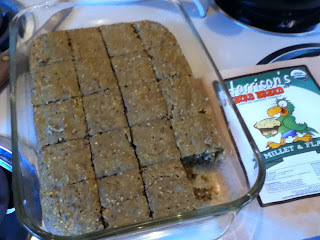 After quarantine, I warmed up a small bit of Harrison's birdie bread and put it in a food dish for both Flash and Cheb. Flash went right to work, eating his fill of the bread. Cheb watched for a few seconds then dug in himself! I was so happy to stand there and watch Cheb pick up a bit of the bread, chew it, and swallow. He ate a lot of it, too. 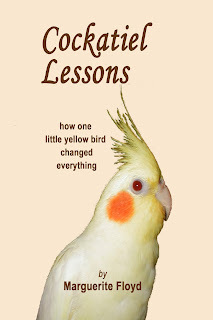 I tried for a day or two to just offer pellets during the day, and then give the cockatiels Nutriberries in the evening, but then I decided I might be rushing things. Now I offer pellets with Nutriberries mixed in. Both birds eat up the Nutriberries, of course, but I'm hoping that Flash does eat a pellet or two (he's always liked them) and that Cheb finally realizes that pellets are good, too. Cheb's been here a bit over a month -- he's eating Nutriberries and Harrison's birdie bread, which are both much more nutritious for him than a seed mix. There's no rush now. I didn't throw out the seed mix. Instead, I tossed it out on the ground under the bird feeder because there are plenty of wild birds out there that need it. I'm so happy to report that Cheb no longer does. Someone else's food is always better than yours; even if it's the same food. I worried that Flash might not like Cheb or that Cheb might not like Flash; I needn't have worried at all. I was prepared for Cheb to say in his own cage for as long as he wanted, which turned out to be less than one day. When they're in the cage they are both busy all the time. Walking back and forth, climbing up and down, chewing on toys. They are quite devoted to walking the perimeter of the cage and to keeping the toys under control -- well, Cheb keeps the toys under control; Flash has never seemed interested in toys. I'm not sure who's "dominant" yet. I'm not sure Cheb knows how to preen or be preened by another bird, though Flash keeps pushing his head at Cheb. Sometimes Flash follows Cheb around; sometimes Cheb follows Flash. I have yet to hear any hissing or any disagreement of any kind. Flash went into Cheb's cage to welcome him to the house. Cheb continues to chat incessantly, and I think he's practicing some new words, which I can't wait to hear. I am so lucky to have Cheb; I don't know how his ex-mom could have given him up but if she ever comes across this blog I want her to know that Cheb is happy, he's good friends with Flash, he's healthy and is slowly eating better, and is in all ways quite full of himself. Believe it or not, it can be difficult to sate Charli's desire for more paper things to chew on. She's gone through phone books, envelopes, note pads -- anything anywhere. I was browsing the clearance section at Books for Half the other day and came upon several books of a very healthy thickness. They weren't books I was interested in reading, but I knew that Charli would enjoy them. Better yet -- they were either half a dollar or a dollar each! You can't buy much of a bird toy for that little these days. Charli has approved of these purchases. I only have three left, but I'm confident Books for Half will be able to supply many more. Charli is a paper chewer. She'll chew on wood once in awhile, but she much prefers paper. She adores chewing on my personal and valuable books, so it's a constant battle keeping her away from my bookshelves. Her most favorite toy is a simple roll of blank adding machine tape. I buy it in boxes of 12 rolls, and stick one roll on a pencil, which I then thread through the bars of her cage. Immediately she begins chewing on it. Slowly and methodically, she chews and gnaws on the roll until the paper begins to fall in long drapes of ribbon down to the floor of the cage. Of course, there are always lots and lots of little bits of paper that fall outside the cage, which I cannot avoid walking in and tracking all over the house so that within a day or so my entire house looks like it has been in a snow storm. No matter. The tightly wound paper rolls make Charli happy. 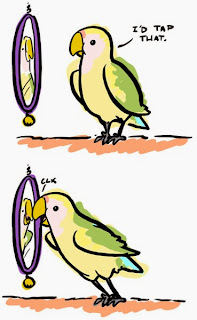 I've never lived with a talking parrot before Cheb, so I haven't been prepared for the nightly ritual, which goes as follows . . . . I cover up Cheb's cage and wish him a good night. A few minutes later I hear a soft "whatcha doing," followed by a louder "whatcha doing." Followed then by "pretty bird," repeated at various sound levels. Then an entire assortment of noises and gurgles and whistles and mumbling goes on for maybe ten more minutes. All this plus frequent chattering during the day. Cheb's ability is really amazing, and I'm thrilled to have him. But it's taking some getting used to. 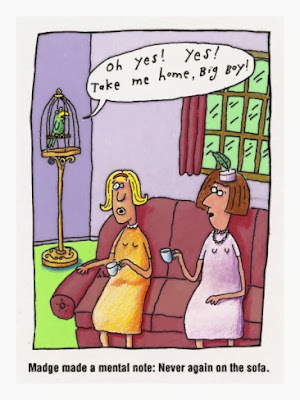 If you're a parrot slave and enjoy jokes and cartoons about parrots, have I got a blog for you! I've been posting humorous memes related to parrots and other birds on Scritches.com for a time now. Not every day or on any kind of regular schedule -- just whenever the mood strikes. Cheb was on an all-seed diet when I adopted him. In fact, I suspect he's been on an all-seed diet all of his life. We don't know exactly how old he is, but I think he's relatively young. Getting him on Harrison's is one of my first goals with him. In this picture is his usual mixed seed, which he is ignoring in favor of bits of millet spray. He evidently doesn't recognize pellets as food. I've been crumbling up Nutriberries on top of his seed mix, and he seems to like those pretty well -- ignoring the pellets, of course. Flash's basic diet is Harrison's, so I'm really hoping he'll show Cheb that they're okay to eat when quarantine is over. I'm also hoping Flash will teach Cheb how to use the water bottle. Cheb talks and whistles all day, and Flash shrieks and paces and worries because there's another cockatiel in the house he can't see. I reassure him as best I can, but he isn't convinced.